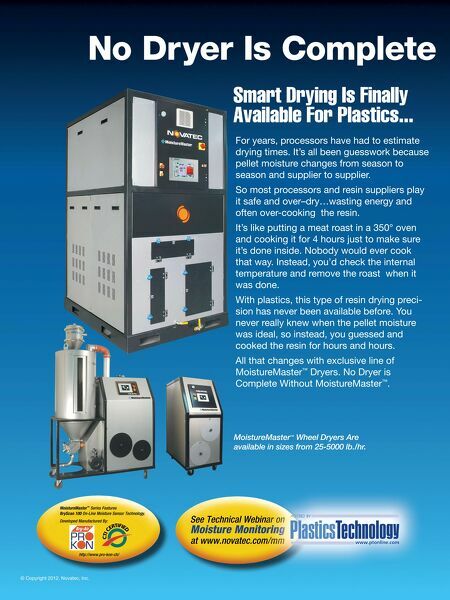 No Dryer Is Complete Smart Drying Is Finally Available For Plastics... For years, processors have had to estimate drying times. It's all been guesswork because pellet moisture changes from season to season and supplier to supplier. So most processors and resin suppliers play it safe and over–dry…wasting energy and often over-cooking the resin. It's like putting a meat roast in a 350° oven and cooking it for 4 hours just to make sure it's done inside. Nobody would ever cook that way. Instead, you'd check the internal temperature and remove the roast when it was done. With plastics, this type of resin drying preci- sion has never been available before. You never really knew when the pellet moisture was ideal, so instead, you guessed and cooked the resin for hours and hours. All that changes with exclusive line of MoistureMaster™ Complete Without MoistureMaster™ Dryers. No Dryer is . 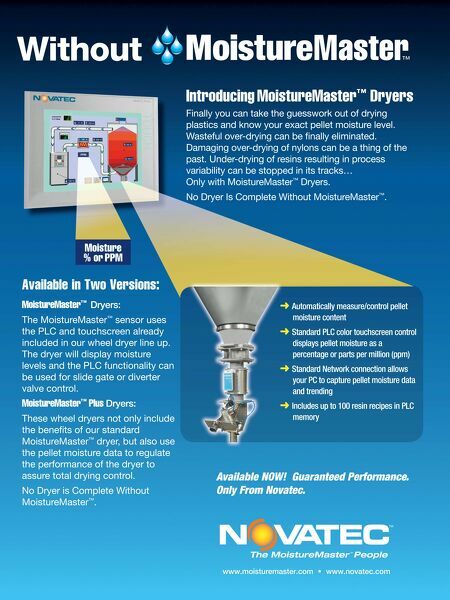 MoistureMaster™ Wheel Dryers Are available in sizes from 25-5000 lb./hr. MoistureMaster™ Series Features BryScan 100 On-Line Moisture Sensor Technology. Developed Manufactured By: See Technical Webinar on Moisture Monitoring at www.novatec.com/mm http://www.pro-kon-ch/ © Copyright 2012, Novatec, Inc.